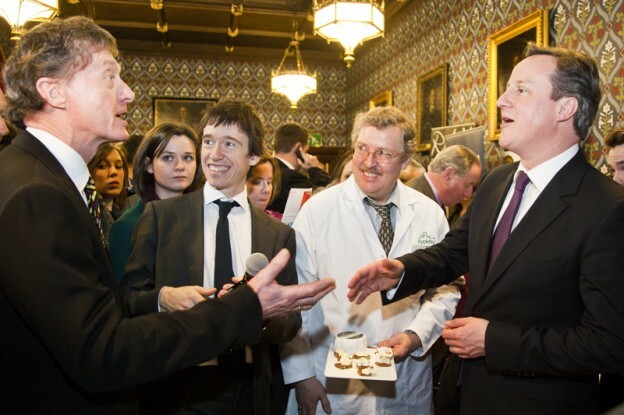 The Prime-Minister was among a hundred MPs who attended “Cumbria Day’ in Parliament today. The day, held in the Jubilee Room at the Houses of Parliament, and organised by Cumbria Tourism, Taste Cumbria and one of the MP’s offices, celebrated all things Cumbria to raise the profile of Cumbria in the nation’s capital. It was supported by all six Cumbrian MPs: Sir Tony Cunningham MP, Tim Farron MP, Jamie Reed MP, John Stevenson MP, Rory Stewart MP and John Woodcock MP. Among the attendees were Cranston’s Butchers and Sillfield Farm who provided Cumberland Sausages, The Toffee Company with Penrith Fudge, the Dalemain Marmalade Awards, the Ulverston Brewing Company, Hard Knott Brewery and Coniston Brewery, the Lake District Cheese Company and Appleby Creamery, Agnes Rose oils and vinegars, pies and cakes from the Broughton Village Bakery, Green’s Bakers and Confectioner and Grasmere Gingerbread. A selection of Cumbrian businesses also attended the day in Westminster including the Derwent Cumberland Pencil Company, New Balance Trainers, Stobart Air as well as representatives from Lake District Search and Mountain Rescue Association, Visit England, the National Trust, English Heritage, the Lake District National Park and Cumbria County and District Councils. Following the event, the six MPs formed an Associate Parliamentary Group for Tourism and Business to take forward Cumbria’s priorities in Westminster on a cross-party basis. Eric Robson, Chair of Cumbria Tourism said: ‘Thank you to Rory and all his colleagues. The day has been a tremendous success; it shows the diversity and quality of Cumbrian products. We know how good Cumbria is, we just need to sell it to other people. The Lake District-Cumbria is a very successful brand. I think following on from today, the real triumph will be the ongoing work with the All Parliamentary Group’.